If you have decided to set up your own real estate agency and haven’t yet found a way to give your business a boost, consider implementing these four real estate marketing strategies that will help you attract more potential customers and increase sales opportunities. As a real estate agent, you have to plan properly in order to get your important tasks done without becoming a slave to your work or getting distracted by unimportant details. Implementing a marketing strategy takes the same type of planning. In order to plan a marketing strategy properly, you need to understand your industry and the competition so you can detect opportunities. To do this, start by analyzing the real estate sector. It seems incredible that a decade has passed since the housing market collapsed plunging the economy into a serious crisis. Housing prices fell by 12.4 percent in the fourth quarter of 2008 alone recording the biggest year-on-year decline since the National Association of Realtors started registering them in 1979. However, in 2017, the market recovered a large part of what was lost thanks to an 11.4 percent increase in housing prices compared to 2008. According to a Grand View Research report, factors such as rapid urbanization due to migration in search of better facilities, the growing demand for residential real estate space and economic growth in developing regions in countries such as India, China, and many African countries have improved income levels and helped the real estate market. It’s a good time to take advantage of this market recovery and apply effective marketing strategies to improve your business. A good marketing plan will help you gain loyal customers and increase your real estate sales. Your potential clients don’t want to waste time and will appreciate knowing as many details as possible before visiting one of your properties in person. Virtual tours are the best way to offer a complete and detailed view of the properties in order to help potential clients get a real idea about the home in question. In this way, you don’t only gain an advantage over your competitors who only use photographs to show their properties, you can also optimize your resources and your time. In-person visits with your clients will be much more profitable since they’ll know the property in advance and will likely be more interested and willing to make an offer when they decide to schedule a visit. There are many ways to create virtual or immersive tours. Here are some options that you can choose from in order to find something that best suits your needs, preferences, and budget. Create 360º photos or videos: This is basically the same technology used in the Street View of Google Maps. These are interactive images that allow you to move the camera frame 360º to see everything in the environment from a fixed point. You can create a video by linking recordings of your property to 360º from different points and upload it to YouTube and then embed it on your website or even share it on Facebook. To create this virtual tour format you need a 360º camera (easily found on the market for around $/€200) and a tripod. Many of these cameras can be controlled from a free application that requires a few configuration steps and allows you to create videos or images easily and quickly. Surely you’ve heard of webinars, the free online video conferences in which an expert offers valuable information about a specific topic in exchange for a name and an email address. Webinars are one of the key techniques of inbound marketing. This is the type of marketing that happens when a potential client is actively seeking a solution to a problem through a product or service and comes to your business willingly. This is different from outbound marketing which is when you pursue clients who may not be actively looking for your services (think print advertisements, billboards and the like). Generating qualified leads refers to getting the users who are really interested in what you offer to leave their contact information, generally, their name and email. In addition, webinars work very well in B2B companies so it can be an effective marketing strategy for real estate if you dedicate yourself to the sale of commercial or industrial properties. According to a Content Marketing Institute survey, more than 60 percent of B2B marketers use webinars as part of their content strategy. A webinar can be used for different purposes from attracting potential customers to interact with your brand and demonstrating products to keep your customers up to date. It will take time and energy, but those who come to your webinar will know you and you’ll manage to establish a relationship with them. This relationship will make up for the effort when said prospects are prepared to buy a property. Find a theme that appeals to your target audience: You must know your potential clients very well and think about topics that may be of great interest to you and that, at the same time, allow you to fulfill your objectives. For example, someone who wants to buy a new house won’t have the same concerns as someone who has just bought one. Neither will a young couple making their first purchase compared to an investor who wants to acquire a new property. For example, a webinar titled “10 Things You Should Check Before Buying a New House” could be effective for those searching for a property. Promote the webinar during the weeks prior to posting it: In an investigation by BrightTALK, it’s proven that webinars are more successful when they are promoted in advance, generally during the three or four weeks before and during the day of the event. Do not overdo the duration of your webinar: Although most webinars are 45 to 60 minutes, a report from BrightTALK reveals that the average viewing time of a webinar is 22 minutes. So consider making shorter webinars when making yours. Reserve a time for questions at the end of your webinar: The great advantage offered by a live webinar—and what sets it apart from recorded videos—is the possibility for interaction between the public and the expert. To take advantage of this, save some time in the end to answer questions and doubts from the attendees. Once complete, publish the webinar on YouTube: A webinar doesn’t have to be throwaway content. You can record the screen of your computer while you shoot the webinar and then upload it to YouTube or any other platform that allows you to host videos. Then, embed it on your website and make it accessible to your customers. This way your content will get even more exposure. You can also send the video link by email to users who registered for the webinar but weren’t able to attend. That’s a good way to renew the relationship with them, too. Email marketing is the main driver of customer retention for 80 percent of marketers, according to a study by eMarketer. Therefore, one of the main objectives of any content marketing strategy is the generation of leads. It’s a channel that grants direct and personalized communication with users, which allows you to stay in your customers’ minds and continue to cultivate the relationship you established with them. As Katherine Barchetti, an expert in sales and customer service, says. “Make a customer, not a sale.” Don’t focus only on selling through the content of your emails but on earning the trust of your subscribers. Keep in mind that manually sending emails is unsustainable once your database grows. 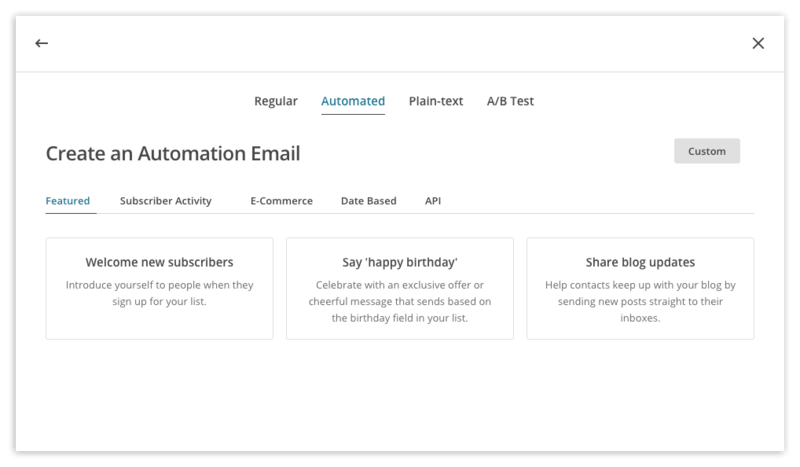 Marketing automation tools, like MailChimp, can help you automate the process of sending basic emails, organize and segment your subscriber lists, create attractive emails in a few minutes and easily send bulk emails. When developing an email marketing campaign for real estate it’s not only important to strategically plan the content that your emails will include, but it’s also essential to invest a portion of your time in determining when and how often emails will be sent to the clients. If you want to know more about how to design your email marketing campaigns and what kind of emails you can send to your leads, check out this post about Email Marketing for SMEs. 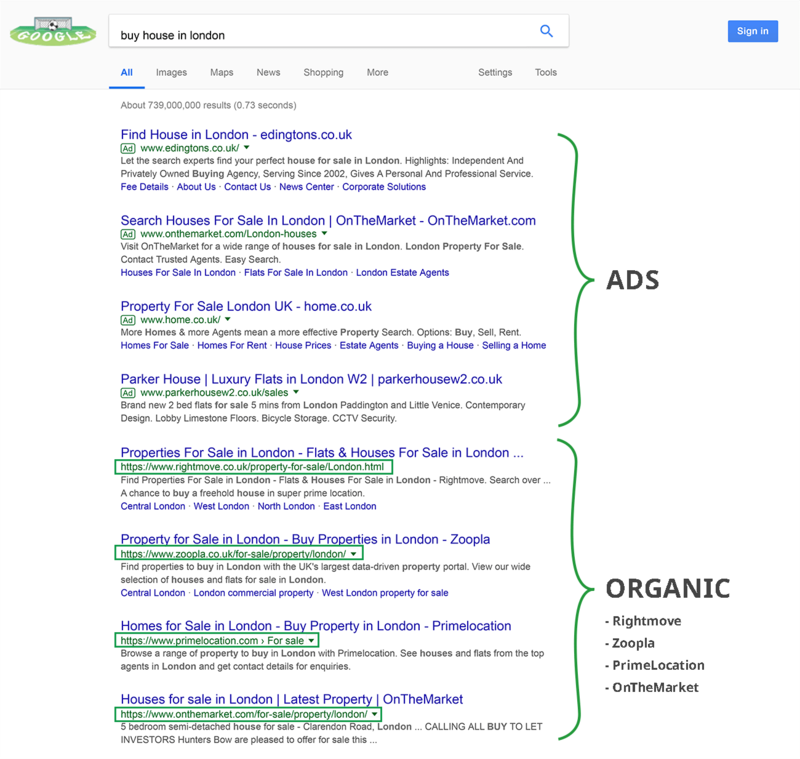 The real estate portals invest heavily in digital marketing and often invade the first page of Google when someone searches, for example, “buy a house in X” or “flats for rent in X” and often are the main points of contact between buyers and sellers. 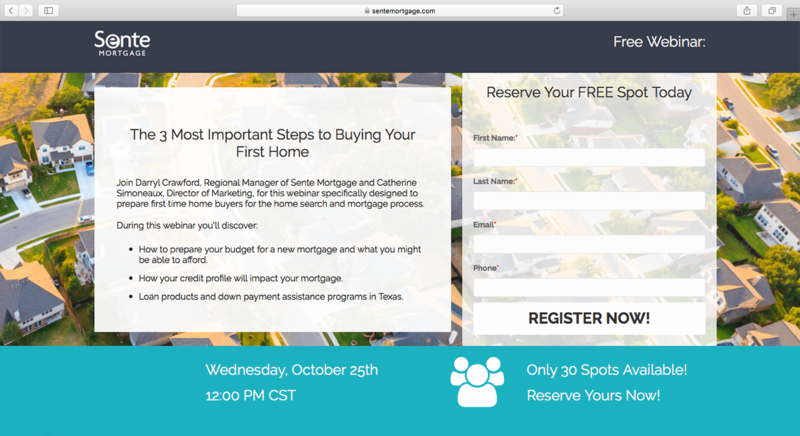 As proof of this, recent research in the United Kingdom showed that 47 percent of the population had used a real estate portal during the last 12 months. The bad part is that people usually don’t browse past the first page of a Google search result. In fact, the stats show that the first page takes at least 75 percent of the clicks with the first position taking 33 percent of the clicks. The good part is that you can join the enemy and take advantage of their positioning to gain more visibility within their platform. 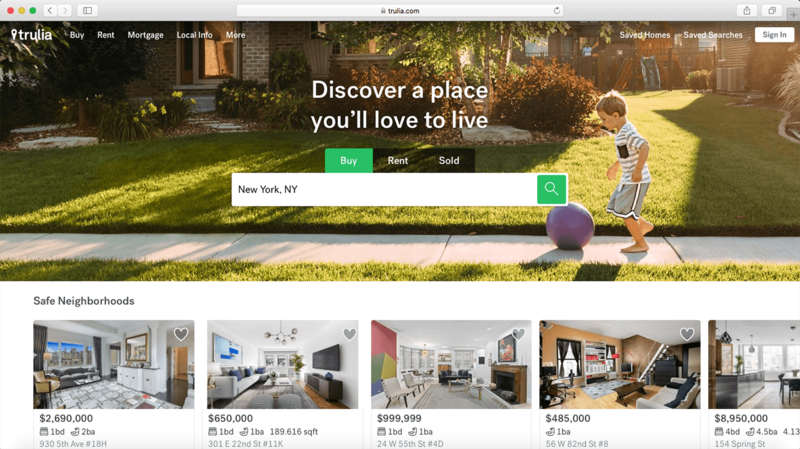 Thus, real estate portals can be an excellent tool for any real estate agency or professional in the industry since they provide visibility to your brand and allow you to display your property catalog beyond your website. According to Simon Baker, CEO of REA Group and an investor in the industry for more than 16 years, there are currently between 8,000 and 10,000 real estate portals around the world. These can be national, international or specialized. Find out about the number of visits their pages receive and the number of properties they host. You can research the company through publications in the media or use SimilarWeb to obtain data about their web traffic. Discover if your target uses them. If it’s a portal dedicated mainly to renting student apartments and your real estate business is dedicated to the sale of commercial properties, publishing an advertisement in it will be time lost. Analyze your conditions, services, and commissions. Decide which are the ones that best suit your needs and will help your bottom line. 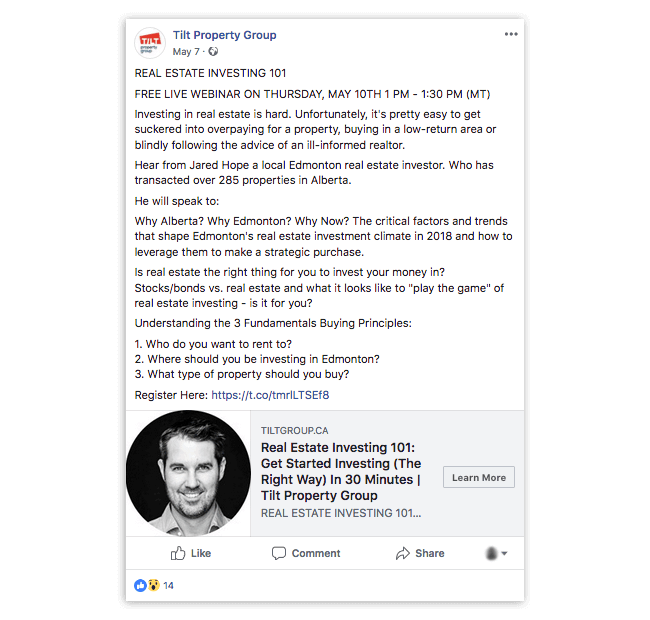 These real estate marketing strategies are all viable options that can help you attract and retain clients to help your business grow. Previous articleWhat is Guerrilla Marketing?